It is possible to play casino games for real money on our tablets, and the best part is we get the portability of a smartphone, while still maintaining the screen size of a laptop. But this doesn’t mean we want to compromise where we are playing just because we have gone portable. Therefore, our team have compiled the best casinos to play at on your tablet and have even picked out a selection of games so you can get tapping. Our favourite tablet casinos are the mobile versions of the best desktop casinos, and are so due to their track record of honest and fair payouts that is verified by their accreditation from advanced gaming jurisdictions. 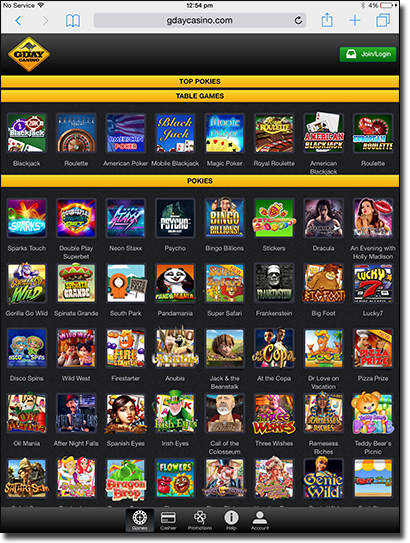 Casino games that are compatible with tablets have been recreated for the HTML5 platform. This means they are going to have features that you won’t find on the desktop versions. We have included some of the features we have noticed so you can keep an eye out for them when playing. Placing your bets on table games: When playing table games on your tablet, instead of clicking on the chip and dragging it or clicking on it then on the layout, you simply tap on the chip size you want to bet and then tap again on the screen to indicate where you want to place your bet. Landscape mode: Many software developers have created their games to be played in landscape mode for tablets. If you have disabled this function, it might be best to enable it prior to playing so you don’t have to get out of the game, enable it, and then go back to the game. How to view the paytable: This comes down to the software provider, but many including NetEnt feature an icon with three horizontal lines for players to tap on to view the paytable. Other software providers, such as Microgaming may just require you to swipe left or right to view this information. Playing on your tablet is an entirely new experience from playing on your desktop or laptop, so take some time to get a feel for it so you don’t accidentally make a wager you didn’t want to make via a few harmless taps. There are a few ways you can access the aforementioned casinos on your tablet and these include via your tablet’s browser, by downloading an app from the casino’s page (a native or a web app), or by creating a web app yourself. We explain what we mean by a native app and a web app below. Tablet’s Web browser: It doesn’t matter what browser your tablet uses, whether it be Safari, Firefox, Google Chrome, or something else, you can access the aforementioned mobile sites. Since you always have to type in the URL to access the sites, you can easily bookmark our site so you can simply click on the link and be taken there via your browser – and score some special exclusive cash bonuses in the process. Download an app from the casino: You can also go to one of the casinos by clicking on our links via your Web browser and here you may be able to download an app. Only Royal Vegas has a native app for all tablets, which is an app that runs on your tablet’s operating system rather than via your tablet’s browser, called Regal Vegas, while Jackpot City has one for Windows-only tablets. The rest of our web casinos will either prompt you to download their Web app – this seems like a native app, but it runs via your browser (an icon will sit on your home screen), or you will be able to create one yourself. Add a casino to your home screen: If you aren’t playing at Royal Vegas, or you haven’t been prompted to download any of the casino’s Web apps, you can create one yourself. Once you are at the tablet casino, simply click on your browser’s settings and find the option that say’s ‘Add to Home Screen’. Click on this, name the app after the casino, and a small icon will sit on your tablet’s home screen so you can access the casino on the go. Some browser’s may not have the option, but the browsers listed above do. We have picked out games to suit every tablet player from table games, to live dealer titles, and even a progressive slot to try. Blackjack Touch at G’day: This is the first blackjack title released by NetEnt in their Blackjack Touch range and features a single deck with a betting range from $1 up to $40. Players can tap their tablet to change the bet size out of 1, 5, and 10. 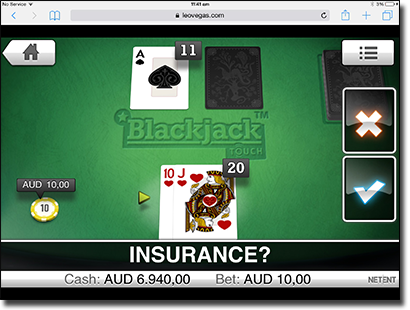 Blackjack Touch features HD graphics and is a good title to start playing blackjack on your tablet. Bridesmaids at Royal Vegas/Regal Vegas: Microgaming’s hottest 2015 release, Bridesmaids, is available at Regal Vegas or the Royal Vegas’s mobile site and it features a 5×4 format with 40 paylines and a multi-level bonus round where you can win cash prizes, free spins, and multipliers. The clips viewed on your tablet are high quality and you can enjoy the funniest moments from the movie while you play for real money. Casino Hold’em at Thrills : Play’n Go has brought Texas Hold’em poker to tablets and it features HD graphics to make playing at a poker table on the go a completely entertaining experience. You have the option to wager 2x your initial ante bet to either call or fold, and if you win the ante bet you will be paid 1:1, or 100:1 if you happen to be have a Royal Flush. There’s also the option of side bets. Mega Moolah at Jackpot City Casino: One of the best progressives available has made many players millionaires. Mega Moolah, by Microgaming, features an African Safari theme with a huge jackpot that can get up to eight figures, which you can win on your tablet by playing the minimum bet of $6.25 per spin. 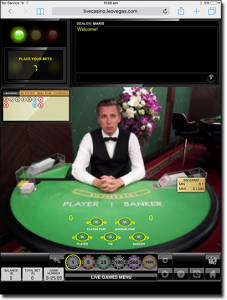 Live Baccarat at Guts: Carry your own personal human dealer around with you on your tablet with Live Baccarat by Evolution Gaming, available at Guts online casino. There are special additions including side bets, such as the Player Pair and Banker Pair. You can bet on these by tapping on the ‘Pairs’ button on your tablet’s screen. Win either bet and you will be paid 11:1. Jacks of better at 32 Red: The most basic video poker variant to get you started on your tablet is Jacks or Better by Microgaming. Players win with pairs of Aces, Kings, Queens, Jacks, two pairs, three of a kind, four of a kind, straight, straight flush, flush, full house and Royal Flush (Royal Flush pays 4000 coins if you’re playing the max bet of five coins). Weigh up the pros and cons, and play the games for yourself on your tablet so you can decide whether gaming on your tablet is for you. The list of tablets is extraordinarily long and we would be here all day if we detailed them all, therefore we have compiled some of the most popular tablets to try casino games out on. If yours isn’t listed, it doesn’t necessarily mean you can’t play, so visit the aforementioned casinos via your tablet to see.